Stenovizor RO-900 radar will allow soldiers of the Russian National Guard to detect terrorists at a safe distance. The Russian National Guard will be equipped with portable radars to detect people behind solid walls and fences, by sensing heartbeats and chest expansion while inhaling. The Federal National Guard Troops Service (FSVNG) will soon be equipped with unique portable radars that can detect people even through thick walls. This will allow the special forces to locate terrorists not only inside buildings, but also in disguised bunkers and underground tunnels. It would also be an effective tool in disaster rescue situations. The latest Stenovizor RO-900 radar, developed by the Logis-Geotech Group of Companies, is able to determine the location of a moving person from a distance of up to 21 metres, being able to “see” through several brick or concrete walls, up to a total thickness of 60 cms. 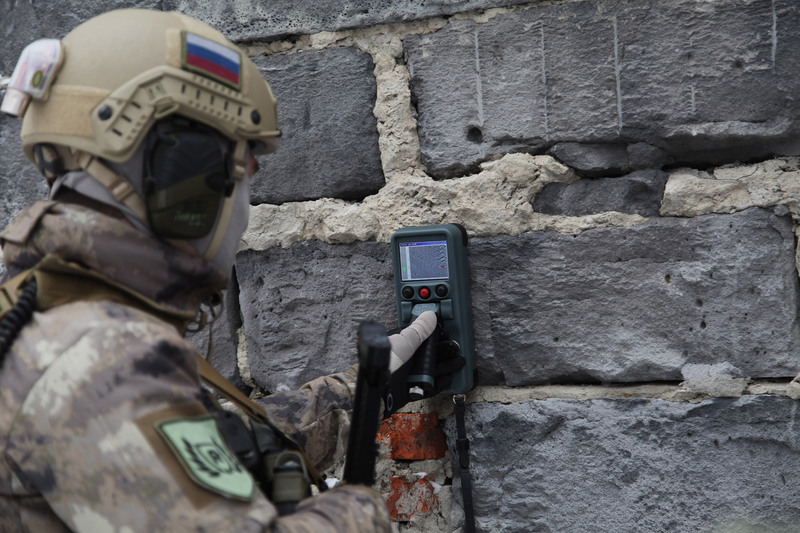 This will allow soldiers of the Russian National Guard to detect terrorists at a safe distance, not only indoors, but also behind walls, defining their trajectory of movement. Even militants who are motionless can be detected by the radar through their breathing. The Stenovizor is very compact, weighing less than one kilogram. The Stenovizor RO-900 operates on the principles of a ground penetrating radar (GPR) locator, which is able to send out radio waves, not only through the air, but also through the earth and the walls of buildings, and register all the reflections coming from obstacles. The radar unit looks similar to an ordinary radio, without the antenna. It is equipped with a 3.5 inch colour display, which shows real-time radar reconnaissance results. The data is displayed in the form of moving diagonal red stripes – the vertical direction of the screen displays information about the distance over which a person has moved, while the horizontal direction displays the time during which he made the manoeuvre. The radar also detects repetitive small-amplitude motion, helping it to detect the expansion of the chest while breathing in, or a heartbeat. The radar takes barely 20 seconds to analyse the received data and displays the information about hidden people on the display as a horizontal blue line. Experts believe that the Stenovizor will provide great assistance during battle, or counter-terrorist operations in urban areas. Karyakin said special units of NATO countries now use the ‘through-the-wall tactical vision’ systems in such situations. This Russian invention is therefore unique, and can provide significant advantages to Russian security officials.